Because of the vodka induced nap that consumed a couple of hours of our afternoon the sun was beginning to set in Vienna before we had a chance to genuinely explore. When we eventually made it out onto the streets it was clear that Vienna offered far more than Zilina, and a different beauty to Krakow. As with everywhere we have been our initial thought tends to turn to food. Tonight was no different. 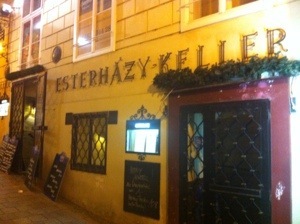 We headed for a traditional Viennese restaurant called Esterhazy Keller where we were greeted by a very friendly waitress in traditional dress. She informed us that we only had a few more minutes to order our buffet style food. Everything on offer appeared appetising at this point but we decided upon the carvings of meat with sauerkraut and potato dumplings. It was more than enough for both of us. 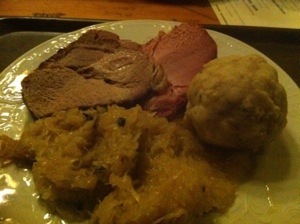 The sauerkraut in particular was very sour and was not to Kate’s liking. The food, the accents and the ambiance definitely confirmed that Austria, despite neighbouring, is very different to Slovakia. By the time we had finished and enjoyed an Austrian beer we were ready to sleep. A short stroll back was enough to knock us both out ready for the next day. Since we had seen very little of the magnificent sights in Vienna during the night we decided to use the morning to see the city by day. It is certainly the most vibrant city we have been to. We had agreed the previous day to spend some time enjoying the cafe culture in the city. We ended up drinking a milkshake though. After this we wanted to find the most famous schnitzel in Vienna, and potentially the world. 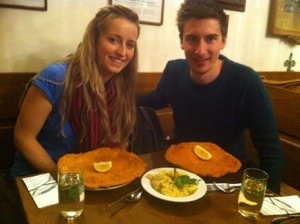 In fact, they claimed to have the worlds biggest schnitzel (we weren’t to be let down). The restaurant was down a small side street but stuck out to us because of the hub of activity in and around it. It was clearly a popular place to dine. Inside we were told we may have to wait for someone to finish but were offered two seats amongst a German family. I once again had to bash out some GCSE German in order to order, which I think was appreciated by our waiter. When the schnitzel arrived I immediately felt beaten. In fact, I left about a quarter and regarded myself as finished before I noticed Kate finish her plate. This meant I had to do the same, obviously. The schnitzel was lovely but partially over shadowed by the fantastic potato salad served alongside. Anyone visiting Vienna must visit Figlmuller for a schnitzel. 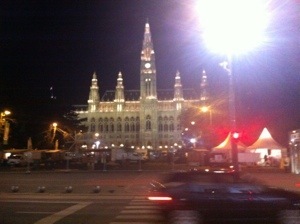 Following our feast of chicken we could hardly move but had onward travel plans for our final destination: Bratislava. 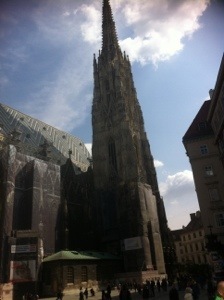 Vienna had been an unplanned venture. It was a short but successful one dominated by food. However, Vienna is food. 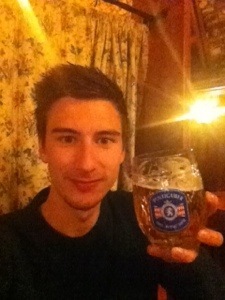 Previous Hitch hiking to Vienna, Austria – Truckers and vodka stops.